The Heritage Orchestra and Pete Tong brought to life some of the tunes that made electronic music what it is today. One of the most anticipated events of the summer, Pete Tong's Ibiza House Classics proved nothing short of spectacular. With The Heritage Orchestra at Destino, it was the picture-book celebration of the 50th anniversary of Pacha. Ever since its appearance in 2015 as Ibiza Prom on BBC1, the original concept had been taking the UK and increasingly the world by storm. Blending contemporary house music and the orchestral tradition, the magical event attracted over 3,000 music lovers, and what a variegated crowd it was. The pretty much sold-out venue had every VIP table taken and more built to accommodate the multitude of people who came out to celebrate the power of music. From hippies to celebrities the likes of David Guetta and Bob Sinclar, people of all ages and walks of life were represented, brought together by a passion for music. Not bad for its debut not only on Ibiza but also in the whole of Spain. The afternoon kicked off with Ibiza legends DJ Pippi and Alfredo on the decks. In turns, they got the crowd going with disco, house classics and funky tunes. As the venue filled to capacity, acrobats, synchronised swimmers, dancers, an opera singer and even a merman performed around the venue and the pool. 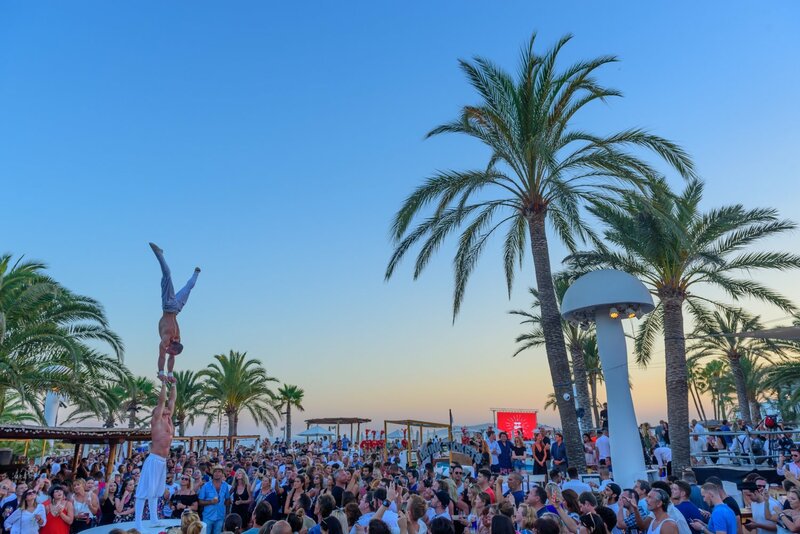 In an incredible display of talent, the Pacha boutique resort put up quite the show, as it is known to do, such as at their sister venue Lío. As a tribal remastering of Yeke Yeke filled the air, the sense of anticipation was almost tangible. While anticipatory beats continued to shake the crowd, the energy kept rising until it was finally time — the moment we had all been waiting for. The crowd exulted as Jules Buckley and the rest of the orchestra began taking their places, enveloped in the purple hues surrounding the huge fifty-year anniversary cherries hanging over the stage. With his usual charisma, Pete Tong took to the microphone, presiding over the 40+ orchestra. Wishing a happy birthday to the legendary Pacha, he welcomed everyone to Ibiza Classics, taking the concept back to its home. As he led the festivities, the crowd was fully involved, jumping, clapping and dancing. Smashing in with Right Here Right Now, the orchestra left everyone mouth agape in awe at the rendition of Fatboy Slim's chart topper from 1999. Till I Come by ATB, Go by Moby, One More Time of Daft Punk — one after the other, the anthems that embodied the rise of dance music came on in new interpretations. A tribute to Robert Miles and his Children could not be missing. With a salute to the late artist who, as Pete Tong reminded us, so loved Ibiza, the orchestra whipped out a poignant rendition of the tune that changed the course of electronic music history. The vocalists kept the mood alive interacting with the crowd singing and dancing. As the laser show framed the picture-perfect moment, Pete Tong and the orchestra were joined by special guest RAYE with a live performance of Good Life by Innercity and later of You Don't Know Me by Jax Jones in its Booka Shade remix Body Language. Jessie Ware also appeared performing Love Story by Layo & Bushwacka. Singing along almost in a frenzy, the crowd could not have been more engaged. By the time Insomnia by Faithless, followed by the medley of Strings of Life, Knights of the Jaguar, Nightmare and Cafe del Mar, the energy was off the chart. Rarely, do you get to see such an excited and engaged audience, with everyone screaming as fresh interpretations of favourite after favourite tune came on, the ultimate Ibiza anthems. After some persuading from the crowd, The Heritage Orchestra delivered an encore with You've Got the Love. As everyone sang along, encouraged by the lyrics and vocalists, all hands were in the air, clapping and cheering as the performers bowed one final time. There's something to be said about experiencing dance music performed by a live orchestra. Bringing together electronic music and the orchestral tradition, this marriage of sounds and styles displayed the power of music to unite. For anyone who has ever said that electronic music is not music, Pete Tong and The Heritage Orchestra demonstrated once again that this is far from the case. If there's one event that brings together all music lovers, it is this one. Next chance you get to experience it live, seize it. You will be happy you did.